Two years ago, I was casually thumbing through the Austin Chronicle when I happened upon an article about a relative newcomer, Jane Bond. She was touted as an artist who was reviving the old style Blues of the early 20th century. Yet, she interjects her own style which makes these “old standards” uniquely her own! My curiosity was piqued, so I decided to see her at the 2002 Austin City Limits Music Festival. I was taken by her sultry, charismatic stage presence. 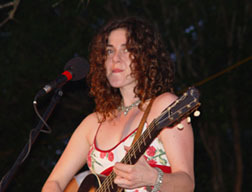 To date, I have probably seen her play a dozen or so times at both ACL Fesitivals, Jovitas, Ego’s, The Continental Club, and most recently at the Nutty Brown Café in Dripping Springs. Each time I see her, I am mesmerized by her deep, soulful vocals, and her powerful onstage persona. I am continually impressed with her natural ability to charm and entertain her audience. Originally, Jane hails from Massachusetts, and I asked her if she missed the Northeastern U.S. She made it clear that she now considered herself a Texan (Austinite), so I quickly turned my attention to her musical roots. Without a doubt, her grandparents were pivotal in encouraging her to become a musician. In her own words, “Grandpa sang barbershop with his friends and various swing songs with Grandma. Grandma had been playing piano professionally in the silent theatre since she was eleven years old, and had an amazing repertoire. She taught me some old jazz standards and when she couldn’t be there to back me up, Mom would.” Family influences were the foundation to her musical career. As a child, she took piano lessons, then learned to play the cello. She sang in the choir as well. At the age of 15, she got her first guitar. She soon learned to cover Blues standards by artists such as Mance Lipscomb and Bessie Smith. She also performs material written by Mike Stevenson. She has added some of her own songs to the mix, showing her versatility as an artist. Her first album, “Jane Bond Volume I,” is more of a traditional Blues album. Jane wrote four of the songs on the CD. “Empty Bottles” is my personal favorite. It is a somber, introspective effort which focuses on the pitfalls of excessive drinking and how self-destructive it can be -- not only to the person overindulging, but to everyone else around him (or her). Her version of Bessie Smith’s “You’ve Got to Gimme Some” is my favorite song overall on her first album. Her beguiling vocals lend well to the song’s subtle, sexual innuendos and double entendre. Her second album, “Jane Bond Volume II Live From the Continental Club,” is much more progressive. Jane covers two of Mark Ambrose’s songs. My favorite is “Going to New Orleans.” It is a story of two young lovers who drop everything and run off to the Big Easy to “tie the knot” on a shrimp boat and then honeymoon in the Crescent City. Incredible stuff! “Train Whistle Blues” has a similar feel. Jane really shines on these two. “Ella Speed”, a Mance Lipscomb song, is quite foreboding. Jane’s voice delves deep to reach the heartrending, expressive, even morbid depths on this one. Her voice truly evokes the tragic nature of this song. The piece de resistance, in my opinion, is a cover of “Sorry ’Bout That” which Nancy Sinatra made popular in 1966. Jane could have gone for the more obvious “Boots,” which most everyone recognizes. Excellent choice, Jane!